In case you are wondering how I get to count this as a project, keep reading. Every spring I plant at least 8 basil plants. These plants grow to anywhere from 24 to 32 inches tall and about 18 to 22 inches wide. They are big. They make LOTS of basil. 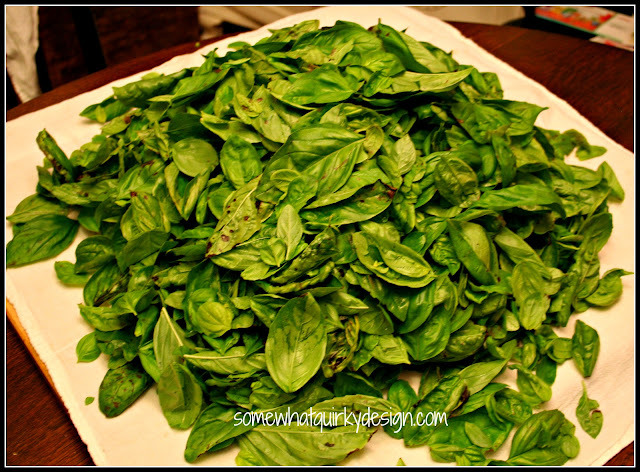 I use about 3% of this basil in recipes over the summer. The rest I use to make pesto. You may remember back in July I gave you my top 360 13 tips on making the worlds best pesto. But I digress. Once it gets to be September the basil production slows down and I steel myself for the day when I have to cut down the basil and make my final mass production of pesto to freeze for the winter. Usually buy this time I already have a dozen or so packages in the freezer. These October bags are my insurance that I will have enough pesto to last until I have fresh basil next June. So yes, cleaning out the basil and making the pesto is indeed a fall fix-up. Chop off the basil at the base. Gather it all up and lay it on the table. Take a picture. This summer two of my plants only produced through July. At this point I am glad. There are a lot of basil leaves to pick off here. Pick off all the leaves. Put them in a pile on the table. Take a picture. Fill the sink halfway with water. 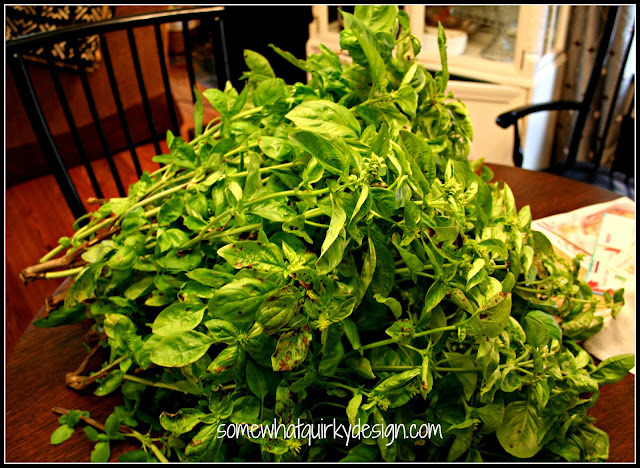 Dump all the basil in the water and let soak long enough for any dirt or bugs on the leaves washes off. If you are like me you may forget you have basil soaking and come back to it several hours later. Drain all the basil in a colander and follow my the instructions from my previous pesto making post for drying the leaves. Put back on the table . . . because there is not a bowl big enough to hold them. Make your pesto. This basil turned out to be just the right amount for 15 recipes. Put the bowl on the table and take a picture. This is what 15 cups of pesto looks like. Measure 1 cup (or however much you want) of pesto into each bag. I just use the ziplock sandwich bags. You want the bags to stay vertical because if you lay them flat the weight of the bags causes the oil to seep out of the bottom bags. You want the bags to freeze as flat as possible while remaining vertical. To do this, put them in a box or plastic bin and then put them in the freezer. Once they are frozen take them out of the box and put them in a freezer safe bags. Just fit in as many as you can into whatever size freezer bags you have. 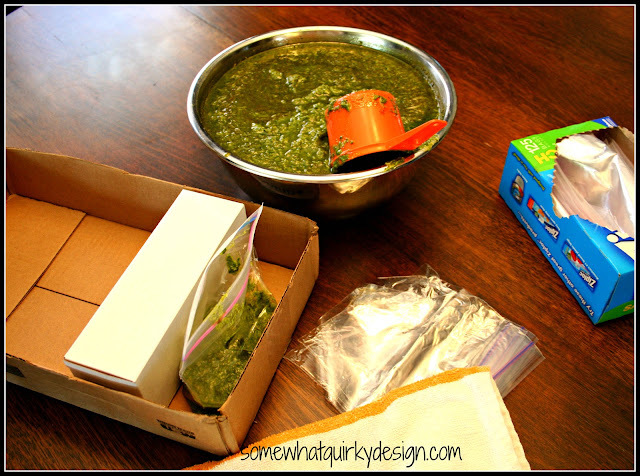 When you want some pesto, take out a bag! It doesn't take long at all to thaw - less than an hour. Note: I have read that pesto freezes for up to 6 months. I have kept it frozen for up to 9 months with no problems. When the pesto is thawed you can unzip it and spoon it out. What I usually do is cut the tip off one of the bottom corners and squeeze it out like icing. oh heck - just look here for 50 ways to use pesto. Well I should certainly try this because my daughter loves Pesto. Having the freezer how-to is great! Oh, and thanks so much for curling up with your computer and going through so many of my posts and taking time to comment on them all. That was very kind of you. I just bet they were a great sleep inducer. Words, words, and more words...you are getting very sleepy! My that's a lot of pesto. If I did all of this, I would then have to cook. 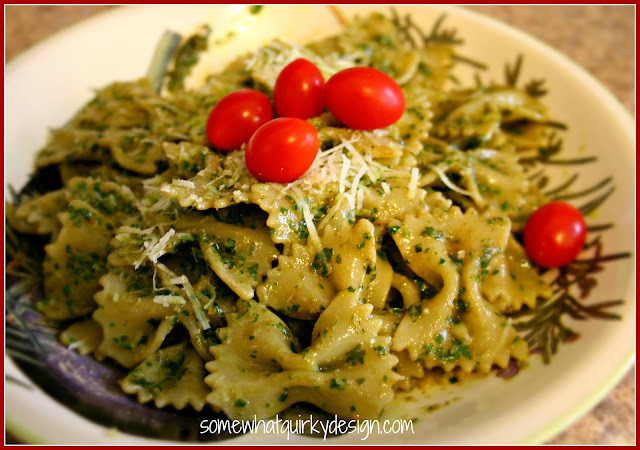 But I will tell you that pesto is one of my very favorite ingredients in pasta. I also think it's one of the prettiest greens on a leafy edible type plant. oh my goodness!!?? What a wonderful idea!!! okay Karen.. so how do you make it? 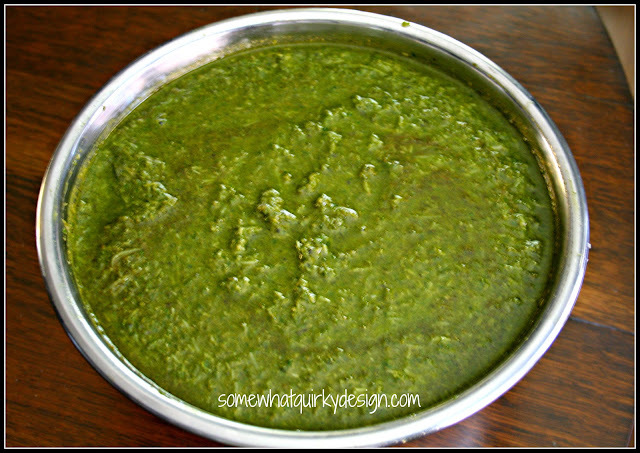 Put the basil in a blender and its pesto?? I want to try!! I love pest too, but best of all I like it on pasta. It looks so delicious Karen, thanks for the freezing tips. I made homemade pesto for the first time this summer, so now next year I'll be planting basil, and then I'll be following your tutorial on freezing. By the way your tutorials sound like mine, guess that's why I like them. Take a picture. Yum city! I will definitely be growing some serious basil next year! Yummm! I love pesto on my scrambled eggs! 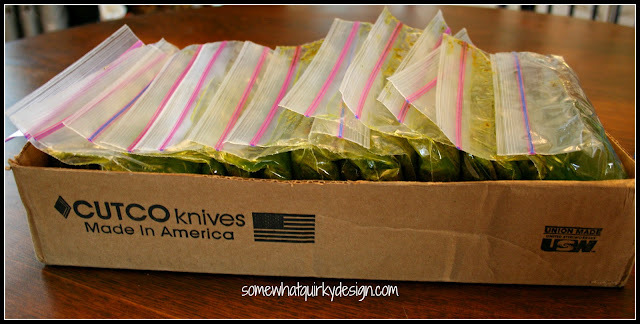 Great tip about the box for freezing them!